I once flipped my college president’s four wheeler in his front yard. My friends and I had been invited to his house to hang out at the lake on his property. When we finished riding jet skis and jumping off the dock, I jumped on a four wheeler to ride up the half mile dirt road back to his house. Being a 21-year-old idiot, I thought it’d be fun to see if I could get the four wheeler in the air coming off a hill. I didn’t get the four wheeler in the air. But I did brake too hard when trying to stop. When I braked, I flipped over the handlebars and into the grass. The four wheeler flipped too and somehow missed my head by about a foot. Luckily I was okay and able to jump back up. I laughed the whole thing off, went inside, and ate dinner with my friends and Jerry Falwell Jr. It wasn’t until a few days later that I realized how intense the wreck was. By Tuesday afternoon, I could barely move. My shoulders ached. My neck was stiff. My back was even worse. The fallout of the wreck was a lot more painful than the wreck itself. 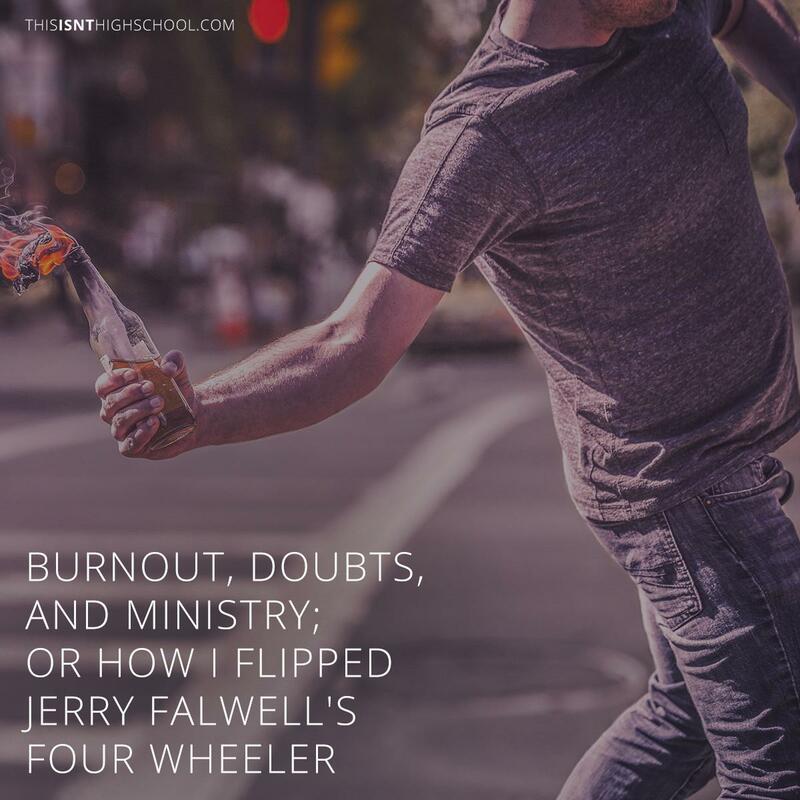 Over the last seven months, I’ve learned the same can be said for ministry burnout. When I left the staff at my old church, I knew I was tired but I didn’t know the extent of the exhaustion. It wasn’t until this week at That Church Conference that I realized how much that burnout had effected me. I never lost my belief in the local church. But I did lose my excitement for it. Being in the weeds of ministry week in and week out gives you a perspective that is great. You get to see ministry happen and watch lives change up close. But you also get to see the messiness of people and relationships as well. Church was a known commodity and had lost its beauty. That Church Conference reminded me how exciting church can (and should) be. The people there rekindled a flame inside me to take the raw gospel to real people in whatever way possible. They also taught me that being on an island is never healthy. When Nicole and I left our previous church, all our relationships disappeared as well. I don’t think anyone meant for those relationships to end, but people are busy and out of site is out of mind. Since January, I’ve worked from home with just myself and the dog. While it’s great to not have to wear pants while working, there’s also a lot of quiet time to think. The thoughts that began to creep in my head were about the ideas I held so near to me. In the vacuum of space and time, the thoughts turned into questions and questions into doubts. Eventually I found myself doubting in the way I believe God has equipped me to do ministry. Encouragement will always trump competition. This conference was full of churches willing and excited to help each other out. Megachurches gave tips to church plants. Church plants gave tips to each other. It was a full of people cheering on what others are doing. Everyone understood that we are God’s plan for reaching God’s people and the only way to reach those people is to work together. At the end of the day, a conference about how to do church in a digital world reminded me that whether analog or digital, online or in real life, the Church is the Church and nothing will ever stop it. A week or so after wrecking the four wheeler, some friends and I got together. We did whatever 20-something college guys do and I forgot about the pain and soreness from the wreck. I’m thinking That Church Conference is going to do the same for my ministry wreck.